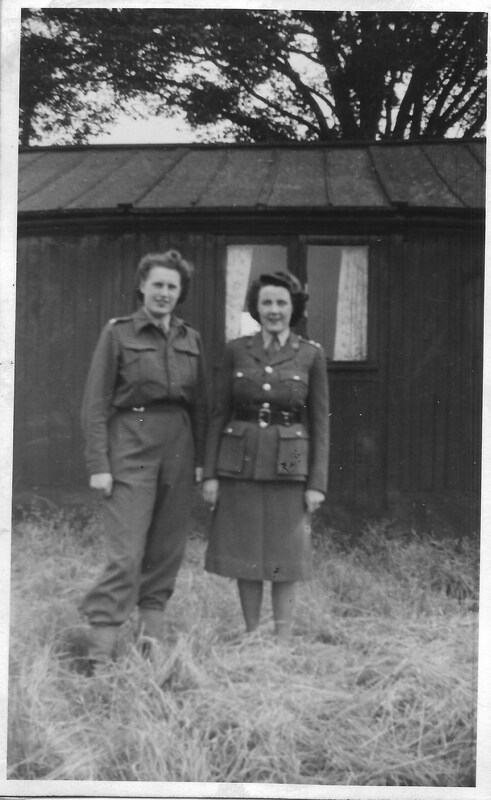 In the last post we learnt how Nancy Dora Dinnis joined the ATS [Auxiliary Territorial Service] in the 93rd (M) Searchlight Regiment. Conditions sounded grim, but it would appear they still managed to make the best of it, and have some fun. Occasions such as Christmas didn’t just pass by, they were celebrated and made to be as special as they could be in the circumstances. 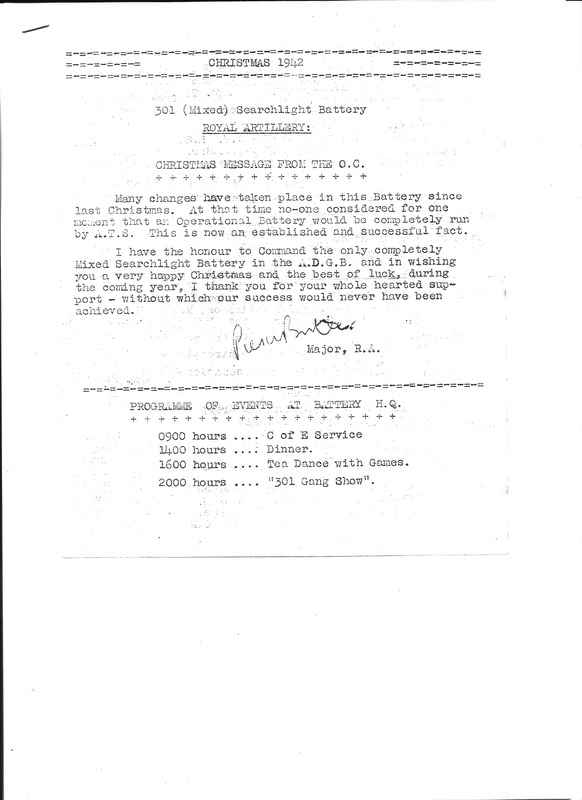 Christmas 1942 was Nancy’s first in the Searchlight Regiment, and she kept a programme of events which I would like to share here. There is a Christmas message from the O.C. Many changes have taken place in this Battery since last Christmas. At that time no-one considered for one moment that an Operational Battery would be completely run by A.T.S. This is now an established and successful fact. I have the honour to Command the only completely Mixed Searchlight Battery in the A.D.G.B. and in wishing you a very happy Christmas and the best of luck, during the coming year, I thank you for your whole-hearted support – without which our success would never have been achieved. Breakfast – Cornflakes or Porridge, Bacon and Egg, Fried Bread and Coffee. Dinner – Roast Chicken and Roast Goose, Boiled Ham, Stuffing, Apple Sauce, Roast and Mashed Potatoes, Brussel Sprouts. 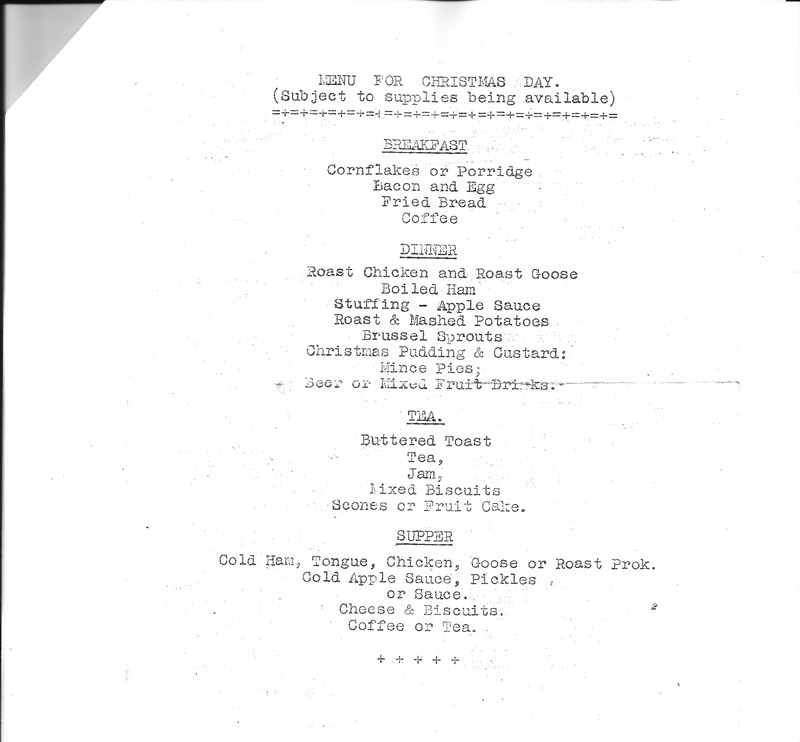 Followed by Christmas Pudding and Custard, Mince Pies, Beer or Mixed Fruit Drinks. Tea – Buttered Toast, Tea, Jam, Mixed Biscuits, Scones or Fruit Cake. Supper – Cold Ham, Tongue, Chicken, Goose or Roast Pork, Cold Apple Sauce, Pickles or Sauce, Cheese and Biscuits, Coffee or Tea. This is very similar to a Christmas Day Menu here today! I guess traditions like these just carry on over the years. The Gang Show on Christmas Day 1942 included the ‘M.T. Glee Singers’, a pantomime called ‘Atsella’ or “Alice in Gunnerland” with all the usual characters – the Ugly Sisters, Fairy Godmother and Prince Charming. Other items on the programme included the Kybosh Minstrels, Boxing and Bert Janes with his Cornet. On another programme the entertainment consists of sketches, a piano recital, ballet dancing, a quiz and community singing. It’s good to see that they still managed to have fun during such tough times. But then we’d joined the Army for better or for worse. Some even got a liking for turning in at ten! We started understanding to think of others too. And pulled our weight together not me – but me and you. but it’s something to remember just now and in later years. The regiment has broken, the time has come to part. In the next post we will catch up with Nancy in the later war years and see how things had progressed for her. 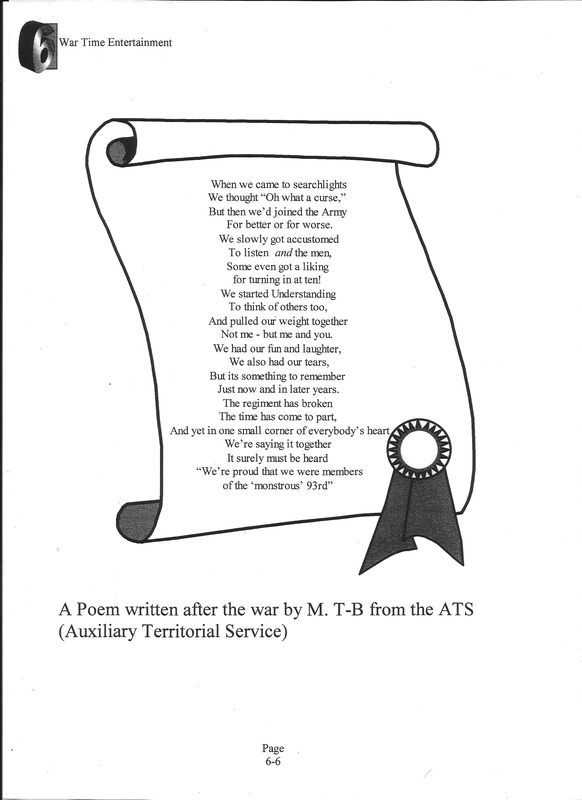 This entry was posted in Nancy Dora Dinnis, World War 2 and tagged ATS, Entertaining the troops, Entertainment, Gang Show, Searchlight Regiment, Wartime entertainment, Women at War. Bookmark the permalink.